Athletes sit on the floor and balance on one foot while reaching across the torso to hold the other foot. Leaning back on the opposite hand, athletes thrust the balancing foot straight up to kick a suspended ball, then land on the kicking foot—without losing balance. This is a game that was played during the long cold winter months to maintain and test one’s agility. Two contestants sit on the floor facing each other, the soles of their feet touching. Feet must be parallel and together, with knees bent. Contestants firmly grasp a stick placed between them. At an official’s signal, contestants try to pull the stick away from their opponent. Traditionally, the event was used as practice for pulling seals from the ice. Two contestants stand next to each other facing in opposite directions, placing one foot alongside their opponent’s and the other foot apart in a shoulder width stance. With their arms held down, contestants grab the opposite end of a tapered and greased wooden dowel. On the start signal, athletes attempt to pull the stick from their opponent’s hand. The game represents grabbing a slippery salmon, and was used traditionally to develop hand and arm strength. Athletes start in a kneeling position, with the tops of their feet flat on the floor, and then jump up and forward. Athletes must land on both feet keeping their balance. Each athlete is allowed three attempts. The winner is the contestant who jumps the greatest distance. From a standing or running start, athletes jump up with both feet, kick a suspended ball with one foot, then land on the same kicking foot—without losing balance. The ball is raised in increments of four inches after each round, and each athlete is allowed three attempts at each height. In many cultures, the One-Foot High Kick was used for signaling a successful hunt. Balancing all their weight on the palm or knuckles of one hand, athletes reach with their free hand to touch a suspended ball, then place their free hand on the floor—without letting any other part of their body touch the floor. The ball is raised in increments of four inches after each round, and each athlete is allowed three attempts at each height. This game was also played during the cold winter months to help maintain physical fitness. This game was developed to demonstrate balance and strength. Athletes make four continuous hops/jumps without losing balance. Starting in a standing position the athlete jumps to one foot, next the free leg behind swings forward and crosses ankles with the first leg while simultaneously switching feet, again jumping to the free foot without crossing this time, and lastly landing on both feet keeping balance. Athletes will have three attempts to achieve their longest jump. The athlete who jumps the farthest distance wins. Traditionally, the Scissor Broad Jump was used to practice balance and agility needed when jumping on ice floes, and to keep warm. Female contestants assume a push-up position with arms straight and palms flat on the floor. Male contestants must maintain a lowered push-up position, with elbows bent, on their hands with their fingers curled at the first knuckle. Contestants hop across the floor on their hands and toes while maintaining the push-up position. Athletes’ movement must be continuous, they cannot pause, and must keep the ridged plank form. The athlete who travels the greatest distance is the winner. The Seal Hop was used traditionally as a game of endurance and stamina, and for sneaking up on a seal, mimicking the mammal’s movement on the ice. Jumping with both feet simultaneously, athletes kick a suspended ball, then land on both feet without falling backwards. The ball is raised in increments of four inches after each round. Each athlete is allowed three attempts at each height. The Two-Foot High Kick was historically used to communicate the success of a spring hunt. Starting from a sitting position, athletes hook one wrist over the middle of a long pole held by two carriers. Without touching the pole or floor with any other part of the body, athletes suspend themselves off the pole and maintain the position while being carried over the course until they can no longer hold their own weight. Carriers may walk or run through the course. The athlete covering the greatest distance while suspended wins. The Wrist Carry represents the significance of a successful hunt and traditionally tests strength and pain endurance of hunters, while showing appreciation for the animal giving itself. 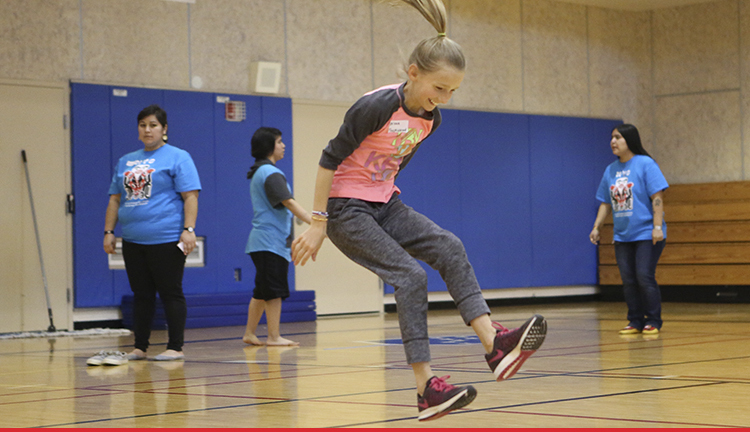 Juneau’s NYO team is sponsored by SHI, Central Council of Tlingit & Haida, Juneau Tlingit & Haida Community Council, Alaska Native Sisterhood Camp 70, Alaska Native Sisterhood Camp 2, Alaska Native Brotherhood Camp 70 and Juneau School District’s Indian Studies Program. Special thanks to Trickster Company for designing the team uniforms in kind.